Chalk Talk Education Consulting is a global education service provider. Our primary goal is to take on projects that invest in children and youth, equipping them with the knowledge and skills they need to navigate our increasingly globalized world while promoting respect for human rights as a common system of values and action. I am also a freelance researcher and editor - SEE EDITING SERVICES HERE. By supporting the education sector and NGOs focused on human rights and youth, we aim to increase the capacity of all youth--especially those who are marginalized--to develop into their full potential and live authentically within the rapidly changing and interconnected global, social, environmental and economic systems. The combined skills and passions of the team leader, Dina, and her external supporters include a strong background in human rights, teaching, youth facilitation, writing and editing educational resources. In collaboration with the education sector and with youth, we have developed and delivered global education programming linked to mandated curricula through in-service education, professional development, and by engaging children and youth in peer-to-peer learning. Collectively, we have been contributing to the growth and transformation of Canada’s global education landscape. We want to continue striving to make our social and learning environments safe, creative spaces for children and youth, a place where everyone has the opportunity to reach for their dreams. 4. Tying It All Together: HIV & AIDS Awareness & Curriculum Outcomes (2008). Curriculum Project coordination: Dina Desveaux & Rena Kulczycki. Note: Please support local artists. 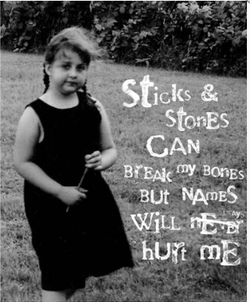 Brenna MacNeil designed 'Sticks & Stones', a Bullying Awareness poster done in concept.